eToro has a fun, easy-to-use trading platform. It has innovative features: social trading lets you copy others and CopyPortfolios allows thematic investing. eToro trading fees are low. Account opening and funding your account are quick and seamless. eToro has an unreliable customer service, and its trading platform freezes sometimes. Also, most of its products are through CFDs only, and not real assets. We compare eToro fees with its peers, Plus500 and Markets.com. Does eToro worth it? eToro has low trading fees. It is not just low, but also straight-forward. There is no commission, everything is included in the spread, the difference between the ask and the bid prices. This super catch-all benchmark includes eToro commission, spreads, and financing costs for all brokers. Making this calculation, it is clear that eToro is low for stocks and average for FX. For cryptocurrencies, there are no additional eToro bitcoin fees, nor for any other cryptocurrencies, as such. Brokers charge financing rates if you hold a leveraged position for more than one day. This can influence your trading fees very much if you tend to hold positions for longer. eToro's yearly financing rates are high compared to other brokers. eToro's non-trading fees are high. Inactivity fee exists, but it is ok. There are no account, deposit, and custody fees. Etoro withdrawal fees and currency conversion are quite expensive. eToro charges a conversion when you deposit or withdraw money from your account in a currency other than USD. The minimum first-time deposit is $200 for all countries, except for Israeli residents ($10.000). It is not clear for us what happens if you go below that level later on. eToro makes it account types simple. There is only one live account type. There is also a demo account to try the platform with play money. The account opening process is enjoyable, very fast, and fully digital. We could open the account within one day. eToro already had a good account opening process, but this was even improved in 2018. You start by registering with your email account or with your Facebook or Google+ account. And boom, you can immediately access the trading platform and can start to trade with a $100,000 demo account. 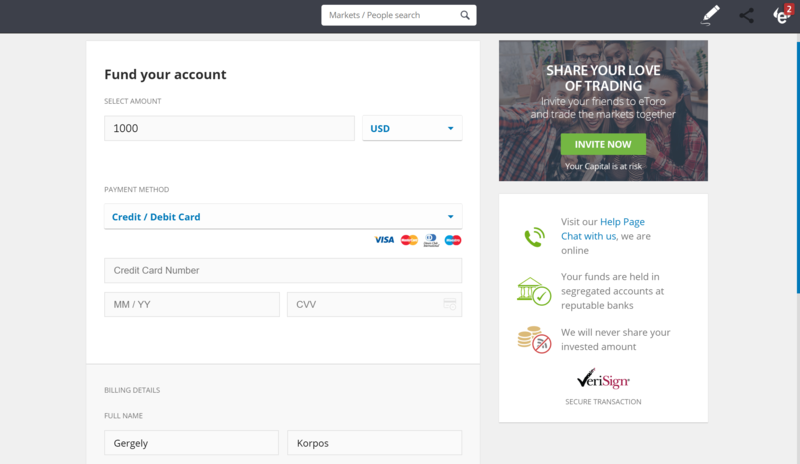 eToro only allows USD accounts. This means your funding will be converted by eToro to USD. For example, if you deposit EUR a 0.025% fee will be applied at funding and it will also be applied when you want to withdraw EUR. Alternatively, you can deposit e.g. your credit card in USD, in that case your bank will convert it on its fees. eToro deposit fees are zero. They provide free deposit. As at other CFD brokers, there are a lot of transfer options at eToro. Bank transfer takes 3-5 business days, and there is a no maximum deposit. Credit/debit card and electronic wallet deposit are instant, but there is a $20,000 and $10,000 maximum on the funding respectively. eToro withdrawal fee is $25 per withdrawal, which is not competitive. eToro applies a $50 minimum withdrawal amount. Withdrawal options are the same as the funding options. There are bank transfer, credit/debit card, and electronic wallet in line with other CFD brokers. 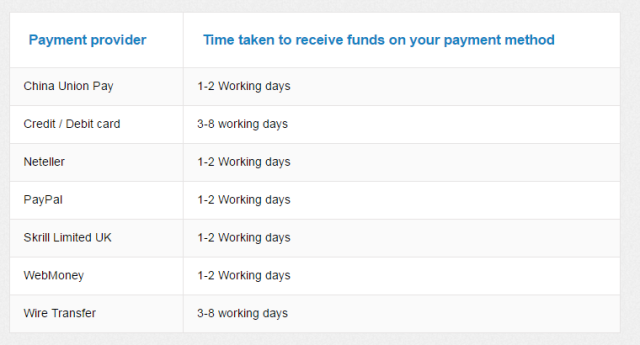 eToro states the typical time per payment method. It is up to 8 working days for credit and debit card and 1-2 working days for electronic wallets, like Paypal. In the heat of the 2017 crypto bubble, eToro had operational problems because of the great customer interest it received. This also had an effect on withdrawal. We tested eToro that time. We received our money, but it took 4 business days. We have tested eToro withdrawal again in the 2019 update and this time everything was according to its disclosed terms. Ok, we say it out loud: eToro's platform looks like a platform should in 2019. Period. It is available in English, German, Spanish, Italian, French, Russian, Polish, Greek, Chinese and Arabic. At the end of 2017, eToro trading platform had a lot of problems because investors went crazy about crypto and eToro could not catch up with the demand. This is now behind eToro. During the 2019 review, we did not experience any problems. eToro's is a pleasure for the eye. With its clean design and great functions, eToro did a great job with combining good design with functionality. The menus and buttons are where you expect them to be, everything is labeled correctly, and the colour scheme is pleasing. It can hardly be customized though, the panels are fixed. One exception is the watchlist which is easy to configure. eToro has an optional two-step login system. This can keep it easy to login, but leaves you without advanced security. The built-in search is predictive and easy to use. Type in a company or a product name and you see the results. Also, search via tickers. You can do only "market", "limit", or "stop loss" orders. It is very self-explanatory how to do it. A great feature: you can set leverage size when opening the position. eToro alert function lets you know when an asset reaches a price target. You also get a notification when your order gets fulfilled. On the web platform, this is an icon update or browser notification. On the mobile, it is a push notification. You can set the alerts and notifications very well. You surely want to know how your portfolio performed and how much fee you paid. Portfolio reports are relatively easy with eToro. Have your assets lined up or have a pie chart on your exposures. When it comes to fee reports, it is not the easiest to find it at first. At Portfolio / History / Top right circle thing / Account Statement lets you download a well-structured pdf showing all your cash flows including fees. When you are following someone you will see all trades individually. However, fees are not consolidated, but listed per fee deduction. The mobile platform is nice and intuitive. Pleasure to use. eToro mobile trading platform is available in iOS and Android. We tested it out iOS. The mobile platform has the same great functionality as the web platform. It applies mobile-specific intuitive functions, such as push notifications or good touch interactions. E.g. you can swipe left and right in your portfolio to access charts or opening a new trade. eToro is primarily a CFD and forex broker. However, you can also trade with real stocks, ETFs, and a lot of different cryptos. 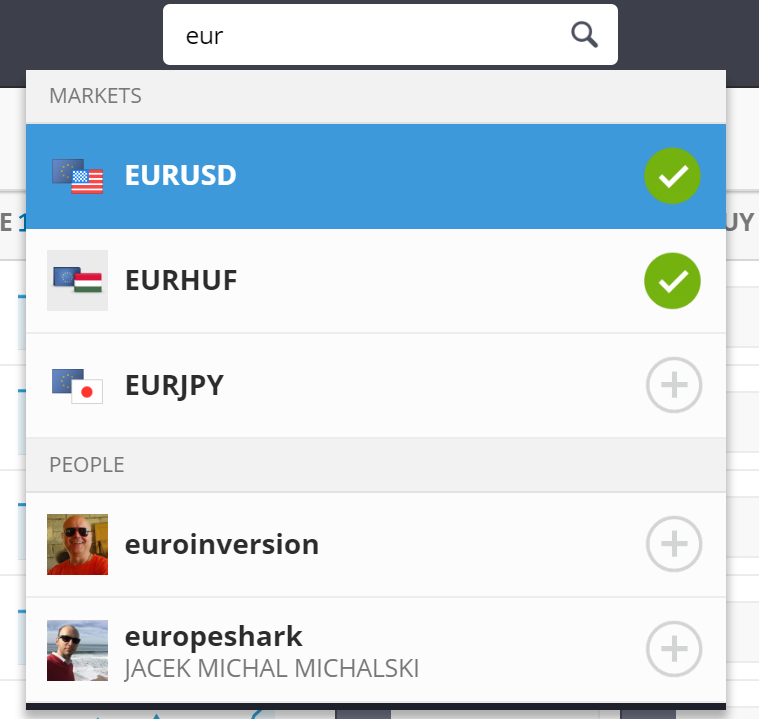 eToro also has some funky features, such as social trading (CopyPeople) and CFD funds (CopyPortfolio). Even experienced investors can get confused. So, let's break down eToro's markets and products. All non-leveraged buy positions for equities, ETFs and cryptocurrencies are traded as real assets. This means when you buy stocks, ETFs or cryptos without leverage (one leverage), you will buy real stocks, ETFs and cryptos, not CFDs. all positions of forex, commodities and indices. follow and copy other traders' trading with a CFD (this is Copy People, also called social trading). invest in a CFD portfolio compiled by professionals (this is CopyPortfolio). CFDs are complex instruments and come with a high risk of losing money rapidly due to leverage. 76% of retail investor accounts lose money when trading with this provider. You should consider whether you understand how CFDs work and whether you can afford to take the high risk of losing your money. When trading CFDs and forex leverage, it is important to have control on leverage. Setting leverage eToro is super easy. When you do the trade, you can select the leverage level. The default leverage is set by eToro. It is, for example, X5 for stock CFDs. The 2018 ESMA regulation set the maximum leverage level for all CFD brokers. If you want to get a clear picture, read this comprehensive overview. eToro has two distinctive innovations, both being great features, CopyTrades and CopyPortfolio. CopyTrades is the so-called social trading feature. What is eToro really good at? Well, this is it! You can copy one by one the portfolio of a professional trader who also trades with eToro. This can be quite useful. At first glance, you can browse through funny looking guys and gals. Luckily, there is far more information about these traders than their pictures. When selecting a trader to follow you can see their previous performance on a yearly and monthly breakdown. Their portfolio is also public information. Additionally, an eToro risk metric is also given. There are tons of more stats, like trades per week, average holding time, performance on charts, a profile description, their news feed comments. Imagine Facebook profiles with fewer inspirational but more market quotes. The minimum amount you can invest in one trade is $200, while the maximum is $500,000. Furthermore, you can copy simultaneously maximum 100 traders. There is one drawback of CopyTrades. You cannot close part of your position, only the full amount. Past performance is not an indication of future results. The trading history presented is less than 5 years old and may not suffice as a basis for investment decisions. This post is not investment advice. CopyPortfolio is practically an investment fund, but under the hood, it is a CFD portfolio. While with Copy Trades you were following one trader, with CopyPortfolio you can invest either in a theme or in an eToro traders portfolio. Investing in themes means for example investing in a portfolio of big banks or cryptocurrencies. Practically, "Big Banks CopyPortfolio" consists CFDs of largest investment banks like Citi, Bank of America, HSBC, and others. The other way of CopyPortfolio is to invest in multiple "star" traders parallelly. 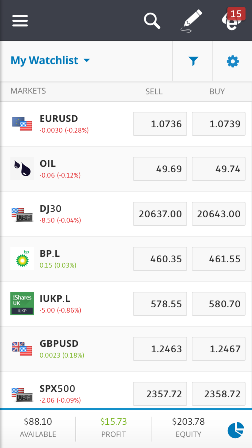 Disclaimer: Indicative prices; current market price is shown on the eToro trading platform. Past performance is not an indication of future results. The trading history presented is less than 5 years old and may not suffice as a basis for investment decisions. This post is not investment advice. The proportion of CFDs in the specific CopyPortfolio is well described. You can check performance, asset distribution and read the investment strategy of the fund. CopyPortfolios are built around a theme by eToro's algorithms or by eToro external partners. This all might sound complicated, but at the end of the day, this means you can easily invest in a quasi-fund. There is a minimum investment requirement for CopyPortfolio which varies between $200 to $10,000 depending on your residency. Besides the minum deposit, eToro also checks your financial knowledge, whether CopyPortfolio are appropriate for you. If you buy non-leveraged stock or ETF, you buy the real asset. Usually, this feature is not offered by other CFD and forex brokers. eToro's 12 stock market access in that sense is great. If you compare it to stockbrokers, like Saxo Bank (36), or Interactive Brokers (74), it is poor. There are also risks you should take into account when you choose stocks. Your capital is at risk. Cryptocurrencies can fluctuate widely in prices and are, therefore, not appropriate for all investors. Trading cryptocurrencies are not supervised by any EU regulatory framework, including MiFID. Therefore when using eToro's Cryptocurrencies Trading Service you will not get any investor protection. Past performance does not guarantee future results. Trading history presented is less than 5 years old and may not suffice as basis for investment decision. Your capital is at risk. 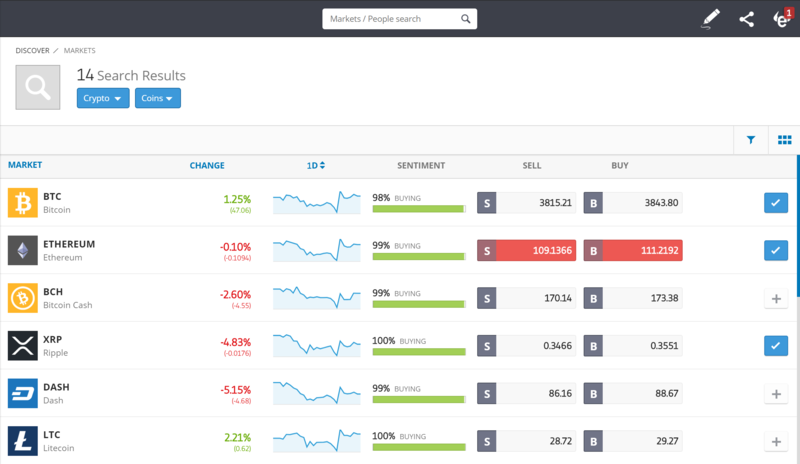 Indicative prices; current market price is shown on the eToro trading platform. Highly volatile unregulated investment product. No EU investor protection. Your capital is at risk. eToro offers a wide variety of crypto coin types, 14. This is far more than at other brokers. Technically, when you go long in any crypto, you will own the real coin. When you go short it is a CFD. At the moment, crypto trading at eToro is non-leveraged. To dig deeper, read eToro' CFD description and we would recommend Brokerchooser's how to invest in bitcoin 101.
eToro has good technical analysis tools. There are some analyst recommendations and market sentiments, but no deeper fundamental data. The research is available in a lot of languages, English, German, Spanish, Italian, French, Russian, Dutch, Norwegian, Portuguese, Slovenian, Polish, Chinese and Arabic. For some popular stocks, you can find recommendations, like analyst consensus (buy/hold/sell), average price target, hedge fund sentiment and insider trading sentiment. In some cases, you can also read the analyst reports. Unfortunately, these research features are available only for a very limited number of stocks. You can find some basic fundamental data on eToro's platform. In case of stocks, this is the profile of the company and some very basic, actual ratios like P/E, EPS, dividend yield and beta. No fundamental data is available for asset classes other than stocks. You can also sign up for a daily market analysis newsletter in which you get a useful list of the market highlights. The charting tool is good and you can use a lot, ~70 indicators. We at Brokerchooser liked that charts are automatically saved, so you don’t have to waste your time with setting up your indicators repeatedly. The news feed is not really an official news feed, e.g. not like an integrated Bloomberg feed. But, rather like a market-themed twitter. eToro users and eToro analysts post messages and this is the news feed. Hashtags for themes and $ signs for assets. We were not a huge fan of this feature, but this is a taste issue, you might like it. eToro's customer service is hard to reach, there is no live chat or phone support. The email support can be slow and does not give fully relevant answers. eToro customer service was very bad at the crypto bubble, end of 2017. For now, it at least works, but still does not do very well. eToro customer service, in theory, is reachable in English, Spanish, Italian, German, Russian, French, Polish, Chinese and Arabic. We only tested it in English. When we tested the e-mail support, the ticketing system, we received our answers between a few minutes and three hours. The quality of the answers was in a professional tone, but in a lot of cases we did not get the the whole answer. To give you a few examples. We asked eToro what they charge when you trade an Apple stock? The answer listed all correct fee types, but failed to answer how fees are calculated or charged. In another case we asked how we can change the leverage level. In the answer it was not described how we can do it, but what is needed to increase the leverage level. For practice, you can use a demo account. 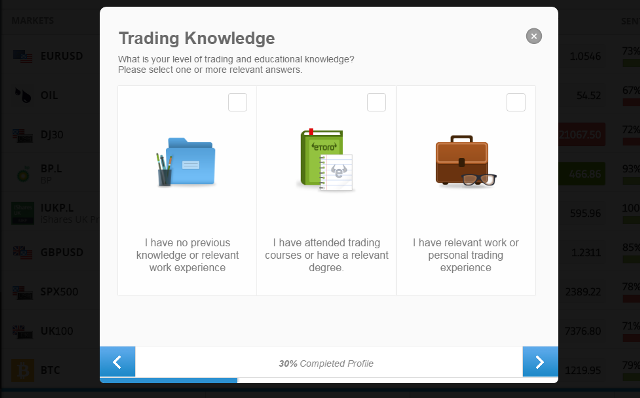 Other education tools are not really strong at eToro. No tutoring videos on how to use the platform, but there are some basic educational videos about investing and the financial markets. You can also take part in webinars. The content that discussed is intended for educational purposes only and should not be considered investment advice. eToro is regulated by top-tier regulators, the FCA and the AISC, and also by Cysec. However, it is not listed on any exchange, does not disclose financial information and does not have a bank parent. eToro is an Israeli broker established in 2007. Is eToro safe? To be certain, it is best to check two things. How you are protected if something goes south, and what the background of the broker is. eToro operates three legal entities and serves customer based on your residency. This matters because the entity you are a client at, defines amount of protection you get. Citizens of the United Kingdom can open an account at eToro (UK) Limited and thus be protected by the FCA. If eToro turns to be insolvent, eToro UK clients can expect to be compensated by the maximum amount of £50,000 guaranteed by the Financial Services Compensation Scheme (the “FSCS”). Australian clients are served by eToro Australia which is regulated by AISC, the Australian regulator. Other investors can have their live trading accounts with eToro (Europe) Limited, regulated by the Cypriot watchdog, CySEC. At eToro Europe branch the covered amount is maximum of €20,000. This threshold is set by the Cypriot Investors Compensation Fund. United Kingdon £50,000 Financial Conduct Authority (FCA) eToro (UK) Ltd.
Other clients €20,000 Cyprus Securities and Exchange Commission (CySEC) eToro (Europe) Ltd.
For cryptos, there is no investor protection. eToro provides negative balance protection. For more details, check eToro’s description of its regulation and license. eToro was founded in 2007. So, it already survived one crisis, which is a good sign. As eToro is a fintech startup, it is privately owned, partly by venture capital funds, like Commerz Ventures Gmbh, the VC of Commerzbank, and there are also Israeli, US, and Chinese investors among the owners. eToro is lead by Yoni Assia, the well-known founder and CEO of eToro. eToro is still a startup. It is not listed on any stock exchange and it also does not provide regular financial statements to the public. Hence, it is hard to look into its financials. It also does not have a bank parent, which could help eToro on rainy days. Being regulated by the FCA is a great sign for eToro's safety. eToro work primarily as a CFD and forex broker, but you can also trade with real stocks, ETFs, and a lot of cryptocurrencies. It is well-known for social trading. Using the social trading function you can follow and copy the portfolio of a professional trader who also trades with eToro. During the time of this eToro review, it is a privately held company, therefore they are not required to publish their ownership structure. What we know is that eToro does not have any banking parent company (little chance for a bailout in case of bankruptcy), and it is currently operating under two legal names. The well-known founder and CEO of eToro is Yoni Assia. eToro (Europe) Ltd. - Cyprus - is regulated by CySEC (Cyprus Securities and Exchange Commission) under license # 109/10, for servicing EEA (European Economic Area) member states, and countries outside it. eToro (UK) Ltd - UK - is regulated by the UK regulator: FCA (Financial Conduct Authority). Spreads: Spreads are the gap between the price you buy/sell and what the broker buys/sells for. To put it simply, if an Apple stock costs 100 USD at market price, eToro will charge 100.1 USD for it. The difference of 0.1 USD / CFD is kept by eToro. For further info read how CFDs work. eTtoro overnight fee: For this, you need to understand two things: Leveraged trades and loans. Leveraged means that you can trade with more funds than you actually have. Let's say you want to trade Apple with 1:10 leverage and you have 10 dollars, this means that you can buy 100 USD worth of Apple with your 10 bucks. The missing 90 dollars eToro fronts for you. eToro finances the remaining 90 USD by providing a loan and charging you for it. eToro is regulated by CySEC in Cyprus, AISC in Australia, and the FCA in the UK. This is a good thing. eToro is not listed on any stock exchange, nor does it publishes its financial data. As a summary of the aforementioned, Brokerchooser feels that eToro is not a scam, but it is not a fully transparent broker. How does eToro copy work? eToro copy, a.k.a. CopyTrade, is a tool for social trading, it works by you copying the trading decisions of other people, or other people copying your trades. You can search for traders and other users, and see how their portfolio has done historically. Once you have found a trader of your liking, you can copy their every trading decision, which is managed automatically by the platform. You can decide how much money you want to invest in copying another trader, and you can close it whenever you wish. If you want, you can also make money by having other traders copy you. If you make profits on eToro they can be subject to taxation laws and regulations. This always depends on the country of your origin. For further information, about etoro tax we recommend contacting your local tax authority. Can I use eToro in the USA? Can I use eToro in Canada? Currently, people from the USA can not use eToro because SEC regulation does not allow brokers to provide CFD (eToro is a CFD broker) instruments for US residents. This means no regulated broker will accept retail clients from the USA to trade CFDs so in this sense it is not only eToro that cannot serve US residents. When will eToro be available in the US? The US SEC (Securities and Exchange Commission) does not allow CFD instruments to be sold to US citizens. Until this law does not change, eToro will not be allowed to operate in the US under its current business model. Past performance is not an indication of future results. The trading history presented is less than 5 complete years and may not suffice as a basis for an investment decision. This is not investment advice.